FS: 2x Twincam wheels, VIC SOLD SOLD SOLD! 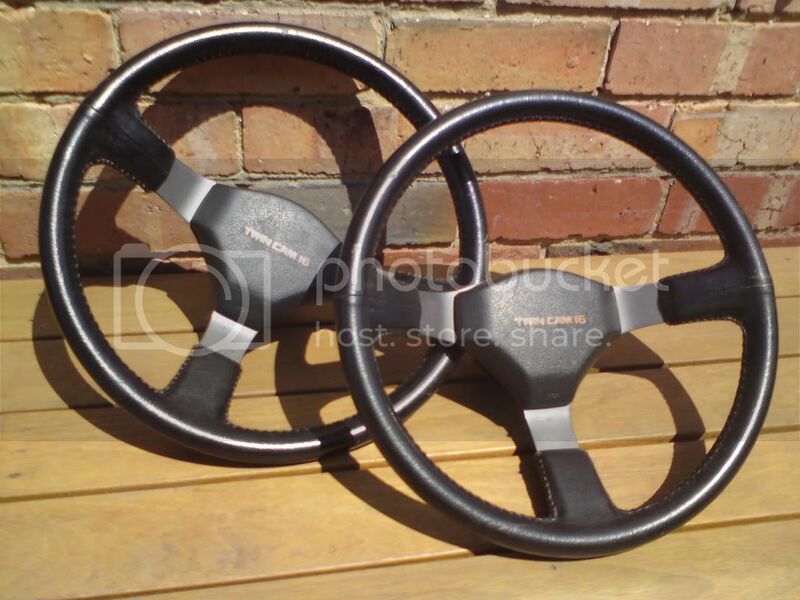 2nd Twincam wheel (Left); All leather is in good condition with tiny blemishes. Horn button pegs have broken so when installing it needs a dab of sikaflex where the pegs used to be just to hold it in place. Once together you cant tell the difference. Both have built in Boss kits. They come out of Ae82 Corolla's. Last edited by Ksevn-T; 20th February 2009 at 01:55 PM. Straight trade for the better one? Don't have the funds to buy one outright, but I'd say my Nardi wheel along with boss and horn button is worth $150 so you're getting the better end. Is that genuine nardi button? Condition is not looking too good though. Would prefer to sell because i have too many steering wheels sitting around. Nah its not a Nardi button, some sort of momo one. i will make an offer of 80 posted to 4271 on the first one. If you pay post ill send.